Join the Geographer-at-Large as he dedicates new Kcymaerxthaere site Universe Farms at Sonberk Winery in the Czech Republic. This event is open to the public. The dedication will take place on Thursday, March 31st @ 3-8 p.m. with concert at 6 p.m.
Come out to Joshua Tree, CA and and enjoy an afternoon at the Kcymaerxthaere site of the Krblin Jihn Kabin with Geographer-at-Large Eames Demetrios and others from the Kcy community. Help restore and inscribe a story from the Jihn Wranglikans on the walls of the Kabin for future visitors to read and enjoy! Light refreshments will be served. Join Geographer-at-Large Eames Demetrios as he dedicated Kcymaerxthaere marker Fath of the [Valp] in Marfa, TX in front of store and gallery Wrong Marfa! $2,950 for Los Angeles locals who do not require accommodation in L.A.
*Trip includes admissions, tour fees, transportation to and from all destinations within Palms Springs, Joshua Tree and Los Angeles, hotel accommodations and meals and beverages (with the exception of meals chosen during free time). Friday, October 5th @ 1:00 p.m. The New Harmony Gallery of Contemporary Art will showcase the project of Kcymaerxthaere through an exhibition highlighting Disputed Likenesses July 26 - September 26 2014. There will be an opening and closing reception. More details will be posted soon regarding the opening and closing events. Sunday, September 28th 2014 at 2:00 p.m.
Ninth Annual Kcy Spelling Bee coming this Sept! Join the Geographer-at-Large Eames Demetrios and our friends at Teri's Threads as they host an afternoon of competition celebrating the words from the parallel world. Please stay tuned for more information! Stop by the Curious Palate in West LA on Monday Dec 16 at 6:30-9:00 p.m. for special book signing of the Please DON'T Connect the Dots activity books from the Geographer-at-Large Eames Demetrios. Get your books for a special price of $12 until the end of our Indiegogo campaign (ends at Midnight December 17) at the Curious Palate. Help encourage thinking and creativity this season and gift the support of global art! *limited parking is available in back of Curious palate and metered parking is available on Venice blvd. Spend the evening with Geographer-at-Large Eames Demetrios in Sarasota for an evening of Kcymaerxthaere Stories and Pop-up shop to raise funds to bring a Kcymaerxthaere site and story to the Ringling Museum! Tuesday, December 3 at 7:00 p.m.
Ends at midnight pacific on December 17! Please DON’T Connect the Dots campaign on Indiegogo! Join us in the support of Please DON'T Connect the Dots, a Disputed Likeness activity book that encourages thinking and creativity from the stories of Kcymaerxthaere! A Disputed Likeness is an interpretation of the characters and stories of Kcymaerxthaere. We need YOU to help bring the stories to life and connect them to people accross the globe. Have an interactive experience with Geographer-at-Large Eames Demetrios and share your creative drawing skills as he shares stories from the parallel world of Kcymaerxthaere at Design Marfa in Friday November 1, 2013 at 3:45 p.m. -5:00 p.m.
Kcymaerxthaere Geographer-at-Large Eames Demetrios will share stories from the parallel world and welcome any help in restoring the original Jihn Wranglikan translation of Thee Gspel akkrding t' Saint Matthew on the walls of the Krblin Jihn Kabin--nine linear years after its first appearance on the HDTS Map. Join Geographer-at-Large Eames Demetrios in the town of Paris, IL on Sunday, September 29 for the Eighth Annual Kcy Spelling Bee Competition. Teri's Threads hosts an afternoon of celebrating the unique words of Kcy through a spelling bee competition from the many stories and cultures of the parallel world. More details to be announced. Stay tuned! Send us your mailing address and we will mail you a hard copy of the words you will need to know for the competition! Come join Geographer-at-Large Eames Demetrios at the Thunder Bay Inn in Big Bay, MI for installation and dedication of the story Tumbles of Tlapak. Installation will start at 10:00 a.m.
Dedication will start at 6:00 p.m.
Time and more info to be announced. Stay tuned! Join Geographer-at-Large Eames Demetrios as he joins the Penduka collective in Groningen as a part of XPO Design tour. There he will tell stories from the parallel world and reintroduce selected embroideries from the disputed likeness collection on display at the Het Paleis. Sunday, March 17th at 4:00 p.m.
Crystals of Refrain is the name of the installation being done in Aghtsk, Armenia. Geographer-at-Large Eames Demetrios will be telling Kcymaerxthaere stories and explaining the permanent art installation he and the Armenian artisans will be creating this spring. This talk is being done in support of an IndieGoGo campaign to bring a part of the global artwork Kcymaerxthaere to Armenia. Join Geographer-at-Large Eames Demetrios in Jakarta at the Gandaria mall on Tuesday December 4th as he shares stories from kcymaerxthaere. Come out for an evening of stories from the parallel world of Geographer-at-Large Eames Demetrios. He will share stories from his global project Kcymaerxthaere at the Beach Museum of Art at Kansas State University. Extended Kcymaerxthaere event at GRAM! We are thrilled to announce the extended exhibit of Along the Lekksenne [Lekcenne]: Kcymaerxthaereal Grand Rapids. If you missed the opportunity to visit during ArtPrize, you can still uncover the stories and relics that create the Geographer-at-Large's parallel world in a unique visitor center-like-experience. While you're in the city of Grand Rapids, bring home an exclusive relic from our Kcymaerxthaere library at GRAM by tweeting pics of all 5 kcy markers located in the city of Grand Rapids including the 6th story engraved in rock at our installation at GRAM. Tweet all 6 pics @kcym winners will be announced and contacted through twitter. This opportunity ends Nov. 23rd. Join Geographer-at-Large Eames Demetrios on Monday, October 22nd at the 8th annual PechaKucha night as he discusses film and stories from Kcymaerxthaere alongside other artists and cultivators that will share their inspiration and stories for a unique evening in part of Salt Lake City Design week. Doors open at 6:00 p.m.
Take Sunburst North from 29 Palms Highway (Route 62) and then take a right on Sunburst to Crestview. Take another right and then one more right for another block. It will be on the left (east) side of the street. On Saturday and Sunday Discover Kcymaerxthaere at the historical site of the Krblin Jihn Kabin and learn the story and history of the Jihn Wranglikans. Geographer-at-Large Eames Demetrios and other artists of the Morongo Valley Basin open their art studios and showcase their work as a part of the annual HWY 62 Art Tours. We will be there from 10 to 6 both days. Help us restore the writing. Take Sunburst North from 29 Palms Highway (Route 62) and then take a right from Sunburst onto Crestview. Drive to Border and take a right. Go down the road for a block. It will be on the left (east) side of the road. Come out for a ceremonial dedication on Wednesday, September 5th at 8 p.m. to welcome a new addition of markers to the story of Kcymaerxthaere. There will be Kcy storytelling followed by the dedication of "The Cave Without Walls" Plaque at The Waterhouse at South Bund. Join in on the excitement of this year's Artprize, the worlds largest art competition as the Grand Rapids Art Museum hosts a special Kcymaerxthaere installation for Artprize 2012. West Michigan being home to 7 Kcy marker sites (and one more on the way!) makes this an exciting Kcy local--whether you are well acquainted with or just now discovering the stories and installations of Kcymaerxthaere. And how fun for it amidst new artists and talents from around the globe. Geographer-at-Large Eames Demetrios brings a new marker that showcases the stories of Kcymaerxthaere to Hokkaido, Japan. The new addition titled The next step will be installed with a special dedication at 3:00 p.m. The installation and special dedication ceremony will take place at Kazenobi (the atelier and gallery of artist Tak Igarashi) a unique art experience that allows the viewer to enjoy the artworks and the ever-changing space that surrounds them through the revolving pieces showcased. For more information please visit italicizehttp://www.igarashistudio.com/blog/en/news/255.html Please help us spread the word! Come and join Geographer-at-Large Eames Demetrios on Sunday, September 30th 2012 at 2 PM local time. The Geographer-at-Large and the people of linear Paris will be celebrating the words of the Kcymaerxthaere stories in Paris, Illinois (home of the Kcymaerxthaere historical site: Embassy Row of the Parisian Diaspora) for a one-of-a-kind Spelling Bee. The locals and folks who travel near and far bring their skills to battle out the nuanced words of Kcy in a fun spelling game. To participate please pick up Spelling Bee Vocabulary lists at Teri's Threads after August 1st 2012. Fun for contestants and audiences alike! Invite friends and help us spread the word! Kcymaerxthaere Scavenger Hunt in Abilene needs your support! Calling all Kcy Fans! We need your support in our community as we launch our fundraiser with Indiegogo to raise money for the Museum of the Bench Trading Cards for the Kcymaerxthaere Scavenger Hunt in Abilene, TX this April! Your support means so much to us as we continue to bring the unique stories of Kcymaerxthaere to our linear world. Geographer-at-Large Eames Demetrios brings his multi-dimensional storytelling of kcymaerxthaere to the QUT 2011 Design Lecture Series Finding Country. Finding Country is a radical project that is concerned with the ground we cannot see. The ground we cannot see is obvious: It is defined by the boundaries, buildings, and cities we live in. Finding Country can only exist when the seemingly exclusive are brought into dialectical tension. Speakers from the USA, Ireland, Japan and Australia will demonstrate comparative ways into design through their individual pursuits. Please join Geographer-at-Large Eames Demetrios on Thursday, May 26th at 5 p.m. for an opening reception to kick off an Exhibition that showcases the parallel world and art of Kcymaexthaere and Paolo Ventura's Winter Stories at the Halsey Institute of Contemporary Art in Charleston, South Carolina (May 27-July 15, 2011). A plaque unveiling will take place following the reception at 7 p.m. Please help us spread the word. Tuesday, April 26th at 6:30 p.m. Please join Geographer-at-Large and the community of Oklahoma Panhandle State University for the dedication of Kcymaerxthaere marker Of Age and Craftsman at Rock Mary on Tuesday, April 26th at 6:30 p.m. Please join Geographer-at-Large and the campus of Oklahoma Panhandle Sate University in Goodwell, Oklahoma for a plaque dedication of Ovret Peltesh. 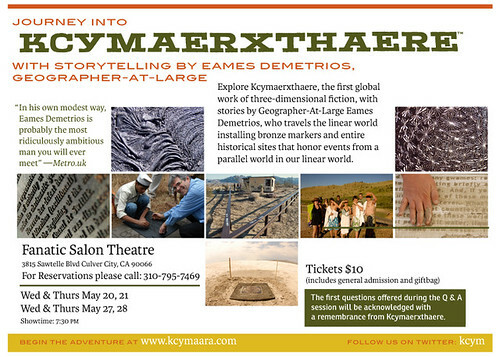 Please join LA Transmedia Group as they present an evening of stories from Kcymaerxthaere with Geographer-At Large Eames Demetrios on Monday, April 4th at 7:30 p.m. at Cafe Metropol. The event will be located in the back of Cafe Metropol. Come join Geographer-At-Large Eames Demetrios as he joins Desert Stories IV at the Hi-Desert Cultural Center's Blak Box Theatre. Back by overwhelming demand from last year’s sold-out performance, Desert Stories returns to the Hi-Desert Cultural Center’s Blak Box Theatre Saturday January 29, 2011 at 7pm. Featuring new eclectic artists, Desert Stories IV is a benefit fundraiser to help rebuild the historic and newly named Kaye Ballard Theatre. “Spoken Word” is a popular form of literary art or artistic performance in which lyrics, poetry, or stories are spoken and may include singing and multi-media visual effects. Come hear some words and stories from Kcymaerxthaere and a few tall tales from some of the Desert’s best storytellers along with other special guests. Desert Stories IV will begin with a pre-show cocktail party at 7pm with performances beginning at 7:30pm Saturday January 29, 2011 at the Hi-Desert Cultural Center’s new state-of-the-art Blak Box Theatre. Tickets are $20, suggested donation. Light complimentary hors d’oeuvres and a no-host cash bar will be available. For more information and/or tickets, call the box office at 760.366.3777 to talk to a “real” person or visit Hi-Desert Cultural Center using the new, easy to use Vendini ticketing system. For Years, artist Eames Demetrios has been active as a Geographer-At-Large, exploring a parallel universe called Kcymaerxthaere. The name comes from the cognate words kcymaara (meaning “the true physicality of the planet“) and xthaere (which is a shape with almost an infinity of edges or dimensions—infinity minus 29 to be precise). He honors aspects of this alternate world by installing bronze plaques and historical sites in our linear world—like a novel with every page in a different place. Currently, there are 74 plaque and historical sites in 13 linear countries with numerous new sites and developments in process now. In February 2010, Demetrios first shared his stories of Kcymaerxthaere with the people of Penduka, a women’s collective in Windhoek, Namibia. These skilled embroiderers, many from the San tradition, began rendering fragments of what Demetrios calls "disputed likenesses" of his stories. He returned in the Fall of 2010 to shares the stories again, discuss the work-to-date and fine tune the collaboration with the embroiderers--focusing on the imagery for three kcymaerxthaereal legends: Culev Larsze, Eliala Mei-Ning, and Kirguellin. Through physical samples and digital connection, the process continued, resulting in (literally) otherworldly embroidery panels. Only 151 of each of story will be available as a limited edition. Each story panel is embroidered by hand by a member of the Penduka collective. The labels on the back give the provenance and edition number. When the edition is complete, Demetrios will continue to work with Penduka to create products inspired by this work as a regular source of income for their community. The bags showing the beloved creature known as the gnacien will be part of the original product series. Thursday, December 16th 2010 6-9 p.m. (at 7p.m. Eames Demetrios reads from the embroideries). Drinks courtesy of Hendrick's Gin. Bring your running shoes! The fastest time between Pynte Ah and Pynte Bae will win a prize! Check the Gwome map for Pynte Ah. Tour of Kcymaerxthaere site by jetpack! Prince of Wales Drive (between the traffic circle and Baseline Rd), Ottawa, Canada. To reach the Museum by bus, take OC TRANSPO #3 (Nepean Centre). Call OC TRANSPO for details at 613 741-4390. Tha Krblin Jihn Kabin is located on Border Avenue one block South of Crestview Drive in Joshua Tree, California. Come out to Paris, Illinois to The Honey Bee Festival that hosts The Fifth Annual Kcy Spelling Bee Competition that showcases the unique words from the stories of Kcymaerxthaere. Come join Geographer-At-Large Eames Demetrios in Terra Haute as he joins their community by sharing his stories from Kcymaerxthaere with a special plaque dedication and book signing at The Terra Haute Street Festival. This is the perfect pre-event to The Fifth Annual Kcy Spelling Bee taking place at Teri's Threads in Paris, IL on September 25th. We hope to see you there! 'Dig Down in Time’, featuring work by sha Bøhling, Eames Demetrios, Jorge De La Garza, Pippa Gatty, Susan Hiller, Susan MacWilliam and Larissa Nowicki. Please join Geographer-At-Large Eames Demetrios as he brings his project of Kcymaerxthaere to The Novalis Ubuntu Institute in The Western Cape in South Africa with a plaque dedication and reception. Installation of marker The Stars Beside in Capetown, South Africa! Please join Geographer-At-Large Eames Demetrios as he brings the story of Kcymaerxthaere to Western Cape, South Africa for install of Kcy plaque The Stars Beside. Rededication ceremony for Kcymaerxthaere site A Writing Appears! Please join Geographer-At-Large Eames Demetrios in Vienna, Austria as he brings his global three-dimensional project Kcymaerxthaere to Habari for a special event. Geographer-At-Large brings his stories of Kcymaerxthaere, the first-global work of three-dimensional fiction to Otis School of Art and Design. Come join Geographer-At-Large Eames Demetrios at The Malzfabrik Art Brunch in Berlin, Germany as he shares stories from his fictional global-project Kcymaerxthaere. This Friday, Please Join Geographer-At-Large Eames Demetrios at The Living Edge showroom in Melbourne, Australia as he shares stories from his global project Kcymaerxthaere. Please spread the word!! We hope to see you there! AND we'll be reporting on the new plaque in Franklinford by a linear church. BONUS: For those that would like to join us, the plaque installation will be earlier that day about an hour and a half out of town. Australia's ABC will be there to cover it. Please join Geographer-At-Large Eames Demetrios at Ted Palm Springs for a special Kcy scavenger hunt experience! Stories from Kcymaerxthaere and Book Signing in Chattanooga!! Please Join Geographer-At-Large Eames Demetrios at Rock Point Books in Chattanooga, TN for a Kcy Vol. 4 booksgining along with Stories from kcymaerxthaere! Kcy Stories and Book Signing in Chattanooga! Please join Geographer-At-Large as he brings stories of Kcymaerxthaere to Rockpoint Books in Chattanooga Tennessee with special book signing in the release of Vol. 4 Travel guide. Stories from Kcymaerxthaere AND book signing in Palm Springs! Kcymaerxthaere book signing in Los Angeles! Please join Geographer-At-Large Eames Demetrios at L.A.'s Meltdown Comics in Hollywood for stories from kcymaerxthaere along with a special books signing and introduction of Kcy travel guide vol. 4. Meltdown Comics is home to Kcymaerxthaere site Remnal of a senging Chave! In part of Kcymaerxthaere's winter book tour 2009! Kcymaerxthaere Book Signing in Denver! Join Geographer-At-Large Eames Demetrios in Denver as he introduces a new volume to the Kcy travel guide family with a special book signing in part of the Kcymaerxthaere winter tour 2009! The way it works is that the event is from 530 to 8, with booksigning through out. But we will do a special bit of storytelling from Kcymaerxthaere at 6:00 PM. Also, for this event, you must RSVP for exact directions to the event site. Kcymaerxthaere book signing in San Francisco! Please join Geographer-At-Large Eames Demetrios in San Francisco as The Electric Works Gallery and The Believer Magazine welcome him to share his stories from Kcymaerxthaere. It is just one part of a great party in San Francisco celebrating the much-slavered-over 2009 Art Issue of The Believer Magazine. Other readers will include Michelle Tea, Jeff Chang, and Michael Paul Mason. There will also be appearances by profoundly special and secret guests, including you. Another cool part of Kcymaerxthaere's winter book tour 2009! Please join Geographer-At-Large Eames Demetrios during Art Basel Miami Beach 2009 at The NADA Festival at the Man&Eve Booth (#405) for storytelling and booksigning from 3 to 5 PM. In particular, he will share the story of Nobunaga-Ventreven from Kcymaerxthaere at 3:30 p.m. Please Join Geographer-At Large Eames Demetrios in part of the Kcymaerxthaere winter book tour 2009! RSVP via facebook and become a fan! Please join Geographer-At-Large Eames Demetrios in a Kcymaerxthaere dedication ceremony North of London this Saturday, please message him on FB for more details!! This is immediately following an introduction of Kcy Travel guide Vol. 4 and Vol. 6 new edition with a special book signing you won't wanna miss! Kcymaerxthaere book signing in London! Anyone in London this weekend? Doing a book signing for the new Kcymaerxthaere Travel Guide (Vol 4) PLUS the updated reprint of Volume 6 at the A-N Booth at Frieze Art Fair (Regents Park) --Sunday at 11:30. Plus a new plaque being dedicated north of London right after at 2:30 PM. Message me for more details. C ya there? Come join Geographer-At-Large Eames Demetrios as he takes you on an a unique tour that showcases kcymaerxthaere installations for Art Prize 2009 in the city of Grand Rapids, Michigan. The tour will start at Kendall College of Art and Design and end at Hopcat Brewery where a reception to celebrate the collaboration of Hopcats and Kcymaerxthaere at Art Prize 2009 will take place. The brewery will be introducing a special limited time Kcymaerxthaere beer. This is an event you won't want to miss! It starts at 6--bring your walking shoes and we'll get to Hopcat around 7 or so. Sunday, September 27th 2009 at 6:00 p.m.
Come celebrate with Kcymaerxthaere and Hopcat Brewery! Grand Rapid's Hopcat Brewery has teamed up with project Kcymaerxthaere to create a limited edition beer to celebrate their collaboration at Art Prize 2009. Please join for a Kcy reception as Hopcat Brewery introduces a very special limited time Kcymaerxthaere Baere. this will also include the last of 5 plaque dedications that day (the first 4 will happen during the dedication tour that starts at 6). Stories of Kcymaerxthaere told in Linear Lake Grace Australia! Please join Geographer-At-Large Eames Demetrios as he brings his stories of Kcymaerxthaere down under to Linear Lake Grace, Australia. Join Geographer-At-Large Eames Demetrios at Home Resource as he tells stories from his three-dimensional fictitious global project called Kcymaerxthaere. There you will find seven-legged deer, an everlasting kiss and many surprises along the way! Don't miss this unique performance! The Golden State and Rumba Art, Design and Decor invite you to an artist reception with Geographer-at-large Eames Demetrios who will be available to discussing his project kcymaerxthaere. Come explore with Geographer-At-Large Eames Demetrios, as he shares his stories about installing bronze plaques and historical sites that honor events from a parallel world in our linear world called kcymaerxthaere. From his unique global work of three-dimensional fiction you won't want to miss! Tuesday June 16th @ 7:00 p.m.
"In his own modest way, Eames Demetrios is probably the most ridiculously ambitious man you will ever meet"
"Like [David] Lynch, he's generous in allowing your imagination to shape his worlds." "a work of impressive invention"
Storytelling from Kcymaerxthaere's Geographer-at-Large, who travels the world installing bronze markers and entire historical sites that honor events from a parallel world in our linear world. So far: 46 sites; 40 gwomes; 8 linear countries; 6 rezhns: more all the time. Eames Demetrios speaks at the Looking Glass Studio in Perth. Losana Restoration visit in Losana, Spain. We did further work on the Wall of [Stoan Orange Glef] and began to understand more of its purpose. The restoration is not complete. One area was left kind of messy and that needs to be cleaned up. In addition, not all the images were extracted from the stone. It's TED's 25th anniversary. But Instead of looking back, we're looking forward. Everyone on the program will be premiering something: a thrilling discovery, a revolutionary idea, a powerful invention, a spectacular piece of art, a first-time performance. We'll share undiscovered talent, and shed new light on names you know. And then, of course, there's another great unveiling: Our new home in Long Beach, California. We had a ceremony at the upstairs New Majestic Bar--fantastic. This was a joyful installation. The story of the Eqlmundi Kirwela of Culev Larsze was told to the kids of Adharshila by the Geographer-at-Large. The students drew many drawings, attempting to convey the details of the story and capturing the essence of the characters. These were collected and vetted for accuracy and then the students painted a mural which depicted the scenes of the story. Eqlmundi Kirwela essentially means Tower of Wisdom in the Cognate tongue and it was built by Culev Larsze in the process of shaking the punishment of the gods. A report of what we did in the small village of Sakad in linear Madhya Pradesh state in what we call India. It is in Adharshila Learning Centre. Please let them know you are coming. it honors the place where the Kmpass, Urgend God of Directionality, separated Mlates gi Dunhuira and Nobunaga-Ventreven, an event that figured directly in the outcome of the Battle of Some Times. These are directions I got from Google Maps. They are from the Village of Kautzen which is nearby. FROM KAUTZEN: Head west on B30/Hauptpl./Thayatal-Bundesstraße toward B30/Heidenreichsteiner Str. Continue to follow B30/Thayatal-Bundesstraße THEN, you take a right towards Alm just as you get to Weissenbach (another village). You go for a kilometer or so and take a right and head up a hill. Honestly? Put the co-ordinates above into Google Maps and print it out. Most people in the area are used to visitors to the ScorpionPlatz which is very close. On Saturday June 25 we are pleased to announce that there will be a plaque dedication and unveiing of a giant map of Kymaerica at 10401 WEST JEFFERSON BLVD in (linear) Culver City, California. The event is from 3-5, with the dedication presentations starting at 3:30. Plaque dedication for the Nayumbo's Wall plaque will occur at 10:30 AM on May 19, 2007. The plaque will be dedicated on Brooks Road, about 100 yards north of Route 2. Please RSVP for the reception, to be held at one of the neighboring homes. Nayumbo's wall was a remarkable structure that went North-South from Buzzard's Bay to the St Lawrence Seeway. Learn more at the event. I am proud to participate in an event known as The Summit: A General Assembly of Real and Self-Declared Countries in the Vera List Courtyard of the New School. It will be held from 5:30 - 9 PM on June 23rd in New York City. Besides participants such as myself and UN diplomats, there will be people from self-declared countries. All part of an exploration of nationhood. On Saturday, November 5, 2005, the Krblin Jihn Kabin will be included in the 4th Annual Morongo Basin Open Studio Art Tours 2005 organized by the Morongo Basin Cultural Arts Council. It will be 9-5 both Saturday and Sunday and I will be out on the site. I'll be giving a gallery talk at the Georgia Art Museum (at University of Georgia) in Athens, Georgia. They have a collection of the Kymaerica limited edition prints (the Mercury Portfolio) and I will be placing them in a historical context. There is also a Kymaerica plaque in Athens there that will be discussed. The talk will be at 11AM Thursday, June 9. On Sunday, November 6, 2005, the Krblin Jihn Kabin will be part of the Morongo Basin Open Studio Art Tour organized by the Morongo Basin Cultural Affairs Council. 9-5 on both weekend days. The event is over, naturally, but the murals are being displayed indefinitely. Here is a link to some pix of what they look like. Please come by and explore them in person: they are a lot of fun. Eames Demetrios, geographer-at-large takes you on a journey into the Kcymaerxthaere. Performing at the Edinburgh fringe Festival at the Edinburgh college of Art. formal ceremony has yet been held, but it was installed on the 26th of July and soon visited by many right honorable members of the community. In New York City at the legendary Strand Bookstore, I'll be doing a conversation and booksigning for the Kymaerican Travel Guide. It will be on Tuesday, May 22nd, on the second floor of the 828 Broadway location in Manhattan and will go from 7:00PM to 8:30PM. It should be fun and the first wide exposure of the Travel Guide in Manhattaan. At the Halcyon Gallery in Terre Haute, Indiana, about half an hour east of Embassy Row and the people of Aedguerre, we will have a gallery show that opens. In addition to a celebration of the marker murals that honoered the first 12 plaques, there will be one of the largest texture flag displays to date as well as a plaque installation. As always, watch the blog for more details. There is an installation of work about Kymaerica at the Halcyon Gallery (near the Swope Museum) in Terre Haute, Indiana from May 1 to May 31. We will have the most extensive collection of texture flags in one place at one time to date. There is also a plaque dedicated nearby. Closing night of the first Kymaerican show in linear Europe is Thursday, April 26, 2007 from 6:00 to 9:00 PM. It has been a wonderful run, the Bus Tour was a success and the plaques are UP! The Geographer-at-Large, Eames Demetrios, will be giving a free lecture at the Sahara West Library in Las Vegas, kNevada on Tuesday, April 10, 2007 at 7 PM. Full details are here on their site. It will be fun. The new Kymaerican Travel Guide will be available. This is part of the Geographer-at-Large's Artist-in-Residency at the Goldwell Open Air Museum near Rhyoleind's capital of Rhyolite. "Demetrios recently uncovered document fragments from what were believed to be long-lost Kymaerican history texts. Demetrios will be leading a hands-on workshop Monday, April 9th, from 6 to 9 p.m. with invited guests to recreate these ancient documents for use in his planned exhibit at the Goldwell Open Air Museum. This is a unique opportunity to be able to participate in the guided creation of a part Demetrios' Kymaerican body of work and a rare artist apprenticship experience with one of the 21st century's most intriguing figures in design. Given the controversy among Kymaerican scholars concerning the veracity of these unearthed documents, the workshop is being held in a secret, exclusive location. Cocktails and repasts will be served in keeping with the ancient tradition. Participation is limited to donors, new and old, to the Goldwell Open Air Museum. If you would like to receive further information about participating, please write the Museum and put "Federica Unifies" in the subject line." In conjunction with the Reflections in the Umbrasphere show, we are having a bus tour of important Kymaerican Sites in linear London. It is going to be a blast, meet at Man&Eve Gallery at 2 PM Saturday March 17, 2007. Allow about 3 hours for the tour. 'Reflections in the Umbrasphere' is the first in-depth UK introduction to Kymaerica - a 3 dimensional storytelling experience that provides a way to see past a world we think is inevitable. It has been put together by geographer-at-large, Eames Demetrios, who is an expert in Kymaerican landscape and history. Kymaerica is a land (and some waters) somewhat co-existent with our linear world, and a general landscape quite similar to large parts of what we would call North America. Kymaerican influences and stories are everywhere in our linear world and likely vice versa. But there also many wonders in Kymaerica not easily found here. Furthermore, Kymaerica is just one of the continent-like structures that makes up this parallel universe. The lands and waters that form the linear United Kingdom reside on yet another. In this exhibition, Demetrios introduces a selection of stories from Kymaerica through a temporary visitors' centre at Man&Eve. We'll be dedicating the first Kymaerican Plaque in aOregon. It will be in Portland, capital of the gwome of Velkristan. It honors the location of Velkristan's Nirvana. The Geographer-at-Large will be giving a Kymaerican overview, some particulars on Velkristan, followed by the plaque dedication and group sing of a Kymaerican anthem. Always alot of fun and never before seen in the district of aOregon. THIS EVENT RESCHEDULED TO SATURDAY. At 11:30 AM on Sunday September 24th, we will have the final round of the first Kymaerican Spelling Bee on the Courthouse Steps (in the Town Square, across the street from 116 N. Main st, home of Embassy Row. Spellers will be responsible for all the words upstairs at Embassy Row, and a special sheet that will be available at Teri's Threads. For spectators, the competition will be quite intense. The spellers are competing for a 100 dollar first prize as well as other prizes. At 3 PM on Saturday September 23rd, we will have the first Kymaerican Spelling Bee in Tooth Alley (just off the Town Square, right next to 116 N. Main st, home of Embassy Row. To sign up, email teristhreadsATverizon.net or drop by Teri's Threads at 112 N. Main Street in Paris, Illinois. At 2 PM on September 21st, I will be giving my first Kymaerican presentation in the UK. I am thrilled and honored that the ICA has invited me to present there. Here's a link to the ICA site. I'll be ont he schedule shortly. Hope you can make it. In Paris, Illinois, we will be having signups for the first Kymaerican Spelling Bee at the Honeybee Festival, which will happen on September 23-24th in Paris (Aedguerre), in the square near Embassy Row. Hope you can make this tour of Embassy Row: Heart of the Parisian Diaspora in Paris, Illinois. It will be Wednesday, June 14 at 1:00 and we will be meeting at 116 N. Main Street (2 doors down from Teri's Threads). It is the first official tour of the site. I think you will enjoy it. At Noonish on Saturday May 27, 2006, at the Hill Country Humidor, site of the Nature of the Waters plaque, B. Mayer and Rob (of the Humidor) will briefly assemble some of the local Kymaerican community for a singalong. There is a show of Kymaerican Images and stories at Meltdown Gallery in Los Angeles from April 30 to May 26th. The Opening Party was a lot of fun (April 30 from 6-8). Alas, this event was not celebrated in the linear world. At the site of every plaque in Kymaerica, starting at exactly 14:32:08 , we will give away a pack of Museum of the Bench Trading Cards to the first 9 people to show up. Some plaques may have slightly different hours because of our caretakers there. More details to follow--not all details have been confirmed. The Krblin Jihn Kabin will be part of the High Desert Test Sites this year (HDTS5) on May 6th and 7th. It will be Open House style on Sunday (there is an event on Saturday). An educator will be present part of the day. Always a wonderful experience and opportunity to see the work of many different artists. Organized by Andrea Zittel. we'll be discussing the site and the recently dedicated historic site on the Parisian Diaspora. There will also be a giveaway of 50 packs of Museum of the Bench trading cards. There is a show of Kymaerican Images and stories at Meltdown Gallery in Los Angeles starting April 30. It is being done in conjunction with the dedication of a new plaque there on May 17th. The Geographer-at-Large will be part of a conversation at the Indianapolis Museum of Art. It will be part of a series where two creators talk about areas of mutual aesthetic fascination. Here is the link to the event itself. Proud to announce that the second Kymaerican Historical Site is up and running in Paris, Illinois. but you need to go to Teri's Threads (at 112 N. Main Street) to be let in--between 10 and 6. It is quite an experience and over the next couple of days we'll be posting images of it here. It was dedicated on April 22nd with great and wonderful fanfare. Paris will be abuzz on the 22nd of April and we hope you will be there. So, part one will begin at noon at Teri's Threads (at the restaurant called the Five and Dime) at 112 North Main Street, Right on the Town Square in Paris. The Geographer-at-Large will give a tour and answer questions. Then we will caravan to the plaque site and learn about Faerie Traces. That will be followed by a party in a meadow nearby. From 6-10 on April 19, 2006, we will celebrating the Land of the Warres, which is both the name of a plaque and an incredible non-organic life form and community in Kymaerican hOhio. In the linear world, we will start with the plaque dedication at 6 or so followed by a tour of the site. Then after a brief stretch of legs, there will be a lecture on Kymaerican history starting at dusk (8 or so) in a nearby alley. Should be fun. The plaque will be located on the north side of Perkins Avenue, a bit west of 55th Street and just east of the the train overpass, on the corner of the building. Here's a blog post on the installation of the plaque. From 12 to 2 on February 12, 2006, we'll be dedicating a plaque honoring some of the heritage of Rhyolite, kNevada--specifically the old cultural heart of the city: Rhyolite's District of Shadows, which currently very near the linear site of the Goldwell Open Air Museum. The event will start around noon, and include a presentation on Kymaerican history, followed by the dedication proper. If you RSVP to the museum by February 9th, you'll get a special gift. We are grateful to the Goldwell Open Air Museum for their support. UPDATE: Here is an article on the event. Starting January 22 through at least the end of April, we'll have a dramatic installation of photomurals, digital prints, paintings and other artifacts from Kymaerica at the Mercury A.I.R. in Athenz, sGeorgia. We also have proofs and previews of the plaques that will be installed over the next couple of months. The artwork IS for sale and truly helps the Kymaerica project. Preceding the opening party is a special Bus Tour visiting important Kymaerican sites between Atlanta and Athens. It starts at 1:30 and seating is limited. The Bus Tour concludes in Athens with dinner followed by this reception. If you are a reader of this website, you are invited. Starting January 22 through the end of March, we'll have a dramatic installation of photomurals, digital prints, paintings and other artifacts from Kymaerica at the Mercury A.I.R. in Athenz, sGeorgia. The first Kymaerican Bus Tour will take place on January 21, 2006 at 1:30 PM. It will be part of the festivities around the opening of the show at Mercury A.I.R. There will be a plaque dedication in Atlanta, followed by visits to various important Kymaerican sites all along the route to Athens. It will be an experience like no other. 95 dollars. Food, fun, an unknown world--what more can you want? If you are interested, order your ticket direct. from 7-9 on August 30th. I'll be talking about Kymaerica in general, but in particular about the upcoming plaque in Rhyoleind. Co-sponsored by the Goldwell Open Air Museum (near Rhyolite, Nevada). Velchmas are traditional Kymaerican rituals wherein major battles are re-enacted by black robed priests manipulating toy soldiers in complex and precise imitation of the historic troop movements. There is no physical location as yet, because it will be webcast. It is unknown if this event took place as scheduled, though common sense would dictate that it did. If you haven't been there yet, this is a great chance to experience the Kabin before the summer. Eames Demetrios will be there to answer questions about the history of the residents: the Jihn Wranglikans caught behind enemy lines after the cease fire with Satgan and the Inland Empire and also the homestedler women who came to take care of them. Saturday May 14th from 2-4. The address is with the plaque description here. Here's a link to a Yahoo Map. The main problem with the map is that it looks like Border goes right through to 29 Palms Highway (the main drag). It does NOT. Take Sunburst north from 29 Palms Highway (Route 62) and then take a right on Sunburst to Crestview. Take another right there and then one more right for another block. It will be on the left (east) side of the street.